Sen. Chuck Schumer has been lobbying for NYPD Commissioner Ray Kelly to replace Homeland Security Secretary Janet Napolitano when she steps down, and on Tuesday, President Obama added fuel to the rumors. 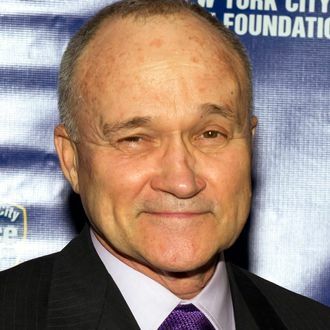 “Ray Kelly’s obviously done an extraordinary job in New York,” Obama said in an interview with Univision’s New York City affiliate. “And the federal government partners a lot with New York, because obviously, our concerns about terrorism often times are focused on big-city targets, and I think Ray Kelly’s one of the best there is.” He added, “Mr. Kelly might be very happy where he is, but if he’s not I’d want to know about it, because obviously he’d be very well qualified for the job.” The president sounded fairly enthusiastic, though it’s not like he could laugh and roll his eyes even if he wanted to.